I offer a FREE 10 minute call to talk about how I can help with your goals! CLICK ON THE LINKS BELOW TO LEARN MORE ABOUT THE ABOVE PACKAGE AND TO BOOK A PACKAGE! Not a fan of online booking? Just email or call me (757-585-5229) and we can set up your appointment. Feel free to visit my FAQ page to learn more. During this assessment we will talk about what brought you here, your history, any medically related issues, and your goals. We review any lab work or other health related data that you have so that we can develop a personalized plan. We will work together to set big picture goals, each with small actionable steps to achieve those goals. I’ll provide you with meal and snack ideas and answer questions you might have. Individual Assessments are up to 90 minutes in length. In your follow up appointment (up to 45 minutes in length) we focus on revisiting and adjusting your goals, talking through struggles you may have, and continue working together to support your progress. Because each mean plan is customized to each individual, an Individual Assessment or Package purchase is required. The Registered Dietitian will be assessing your needs and creating your meal plan based on goals, allergies, intolerances, preferences and nutritional requirements. Once your are an established client, this option is available to you. The food and mood journal is completed through DeVore Nutrition and Wellness's electronic platform. The platform allows us to communicate about your challenges and progress between your appointments, keeping you on track and accountable. You have the ability to either write and/or take pictures of the food you are consuming. Tracking moods/feelings associated with consumption of certain foods is also an invaluable tool that we can use to help identify possible trends. I use a blood test called MRT to identify foods that may be contributing to inflammation in your body. Based on the results of your MRT test I will create an 8 week elimination diet (called LEAP) to hone in on problem foods. This test is especially helpful for individuals suffered from diarrhea predominant Irritable Bowel Syndrome. It is also helpful for individuals with chronic fatigue syndrome, rheumatoid arthritis, inflammatory bowel disease, fibromyalgia, and migraines. This program includes the cost of the MRT food sensitivity test (a blood test), the nutritional counseling (5 sessions), custom recipe selections to help you get through the first phase of elimination diet and shopping ideas to help you find products that work for your unique set of foods (example: specific brands without additives) which saves you lots of time at the store. If you are interested in this package, please call me for a free 10 minute call where we can discuss if you are a good candidate for MRT/Food Sensitivity testing. Curious if you are deficient (or borderline deficient) in any vitamins, minerals, antioxidants, fatty acids, or amino acids? Interested in how well your body is metabolizing carbohydrate? Or how ell your immune and antioxidant systems are functioning? Then this test if for you. 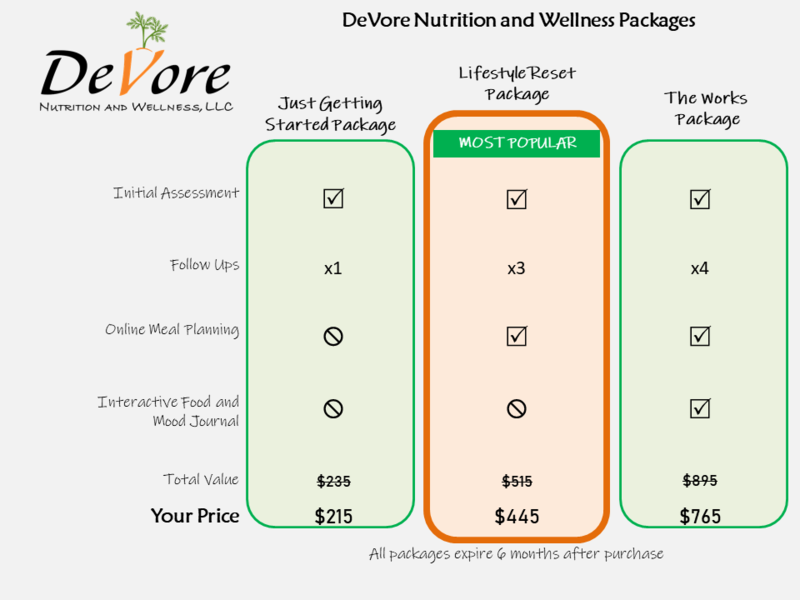 Pricing above is for a one hour consult with DeVore Nutrition and Wellness with extensive notes based off of your Spectracell Micronutrient testing. The pricing above does not include the cost of the Spectracell Micronutrient lab. DeVore Nutrition and Wellness can help you with the paperwork that is needed and to discuss how to submit Spectracell lab costs to your insurance company. DeVore Nutrition and Wellness will have the blood draw kit and paperwork mailed to your home and help you figure out where to get the blood draw done. It takes about 3 weeks to get the results back as it is a very popular test. They send the results electronically to me and then I share them with you during your consultation. Your consultation includes a one hour consult with a custom booklet with extensive information on each nutrient you are deficient or borderline deficiency in, custom supplement recommendations for repletion, and a comprehensive analysis/explanation of how the nutrient deficiencies are likely playing a role in your symptoms. Appointments can take place in person at our office, by phone, or by webcam virtually via DeVore Nutrition and Wellness's HIPAA compliant platform that is secure and easy to use. My areas of specialty include weight management, sports nutrition, food sensitives, food intolerance, food allergies, Irritable Bowel Syndrome, Gastrointestinal Health, children who are picky eaters, and Cardiovascular Health. DeVore Nutrition and wellness also offers: Education for staff that works with children with Food Allergies, Coverage for CCRC facilities as well as Assisted Living Facilities, Corporate Wellness Programs, Workplace Wellness programs, Public Speaking, Sports Nutrition Lectures for teams or organizations, and Grant Funded Culinary Nutrition Education Programs. Click here for more information. See my Frequently Asked Questions page for even more information!